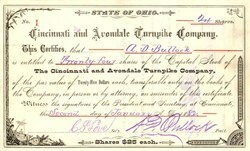 Beautifully engraved certificate from the Cincinnati and Avondale Turnpike Company issued in 1882. This historic document has an ornate border around it with a vignette of someone fishing in the lower left hand corner. This item is hand signed by the Company's President, Anthony D. Bullock and Secretary, C. P. Love and is over 123 years old. Anthony D. Bullock was the founder of the firm,A. D. Bullock & Company. The company was a manufactur of curled hair and dealers in foreign and domestic wools and woolens.